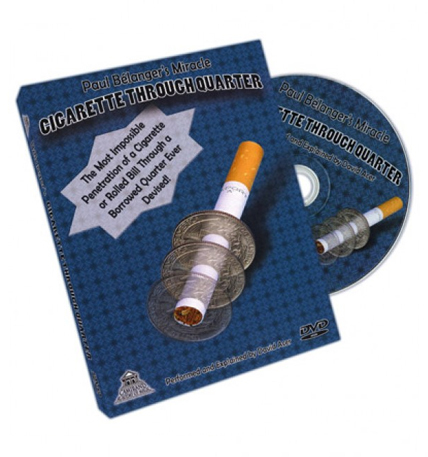 Considered by many to be THE finest version of one of close-up magic's most memorable effects, The Bélanger Cigarette Through Quarter (which can also be performed using a rolled bill) is now available with a companion DVD featuring performances and explanations by David Acer! Imagine this: A borrowed cigarette (or rolled bill) penetrates a borrowed quarter in a stunningly visual, utterly impossible manner! Both the quarter and cigarette (or rolled bill) can be shown on all sides during the penetration! · When the quarter slides off the end of the cigarette or rolled bill, it drops into a spectator's cupped hands FULLY RESTORED, and can be examined immediately! You'll also learn an alternative presentation by David Acer and get a load of bonus clips too!